Its another big day tomorrow. 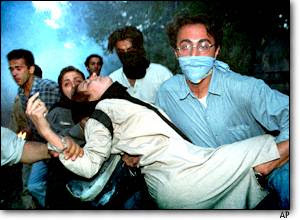 The 10th anniversary of the student uprising in Iran. The student protests in 1999 spread to 19 cities and went on for 6 days. The uprising was brutally crushed but it was the beginning of a new dawn. It gave us hope that change was coming to Iran. That despite all the propaganda machinery of those who consider themselves the 'Representatives of God on earth', the young Iranians had not been duped, and they had not given up. They were as determined as ever to bring about the 100 year old struggle of the Iranian people for democracy and freedom of speech to fruition. 'Freedom of Thought, Forever, Forever' Was the main slogan of those youngsters who had risked their lives by joining the protests in 1999. Ten years on now, the struggle is much more widespread. Now its every section of the Iranian population. The people of Iran deserve your international support. Come and join us outside the Islamic Republic embassy in London, tomorrow 9th July,in London after 5:30 pm. Let the forces of darkness know that the freedom loving people of Iran are not on their own. 16 Prince’s Gate, SW7. The nearest Tube station is South Kensington. 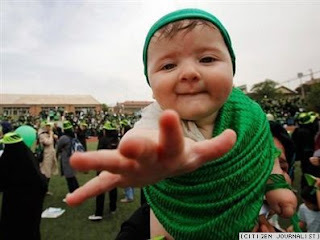 Victory to the freedom loving people of Iran. Is Obama's administration still willing or able to sit at the negotiating table about any issue, publicly or secretly, with a government that spills the blood of its own citizens? Obama is the enemy of free speech and free thought. He supports the 'Supreme Leader' (The only U.S. president to utter those words). If he supported the Iranian people he would have from day one, not wait to see if they will succeed or not.